Leave the wood in the water! This is a friendly reminder to all cleanup volunteers to please only remove trash from streams and rivers. Woody debris and other natural materials in the stream are extremely beneficial for the health of the stream. While it’s human nature to want to tidy up a messy looking stream, please resist this urge. A lot of harm has been done to our rivers by misguided good intentions. Luckily, now we understand the role of wood in the ecosystem and know better than to remove it. Root masses, fallen logs, and the jams they form are vital components of the stream ecosystem. Woody debris provides nursery and foraging habitat for fish by creating slower backwaters and providing shelter to hide under. The leaves that accumulate in log jams are an important source of food and shelter for the stream insects that make up the base of a stream’s food chain. A stream without logs is often a stream without fish. In fact, when ecologists restore streams they often spend thousands of dollars hauling in woody debris to provide those functions. Read “Daylighting the Neponset River”. 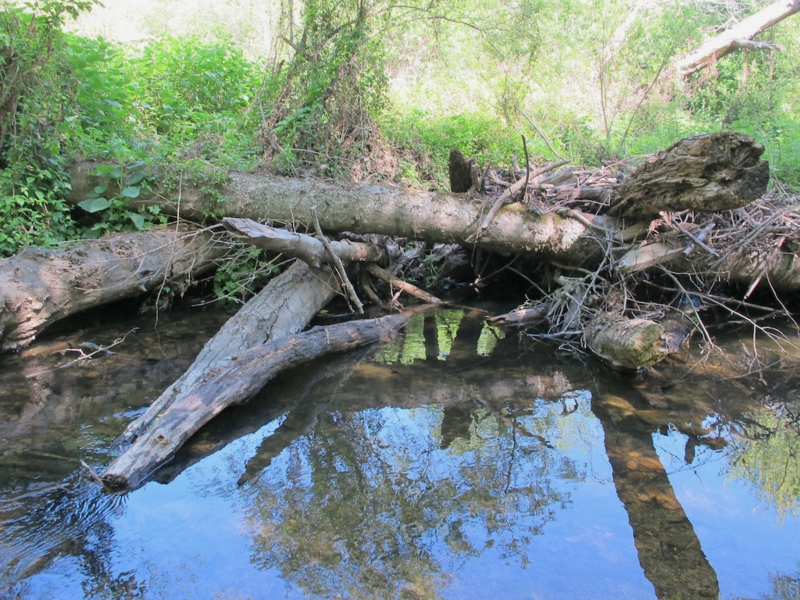 The only time it is recommended to remove woody debris from a stream is if it is threatening public safety or property, like jamming up under a bridge. In those cases it’s recommended to remove the debris and place it back in the stream downstream of the infrastructure. Don’t just take our word for it. You can read more about the importance of woody debris by following the links below.